Get a fast and reliable connection for your gigabit network, computer, games console, DSL modem, router, switches, network ports, and patch panels over long distances. Your KabelDirekt Category 6 cable is capable of transferring internet speeds of 1 gigabits per second across a transmission of 250MHz. The full-duplex function enables data to be sent and received simultaneously, allowing you to use the total bandwidth. Giving you fast throughput speeds and fewer network bottlenecks–increasing your network’s overall performance. F/UTP (Foiled Unshielded Twisted Pair) copper wires prevent external interference and allow fast data transfer over long distances. Ideal if you install in a wall with other cables or near electronic devices. You can be confident your connection is always solid because the Snagless RJ45 connectors protect the locking tabs from being accidentally broken. You’ll never have the sickening feeling after intermittent data loss or disconnects due to your cable coming loose. We pride ourselves on the level of customer service you receive. That’s why our customer service starts before your cable is constructed. 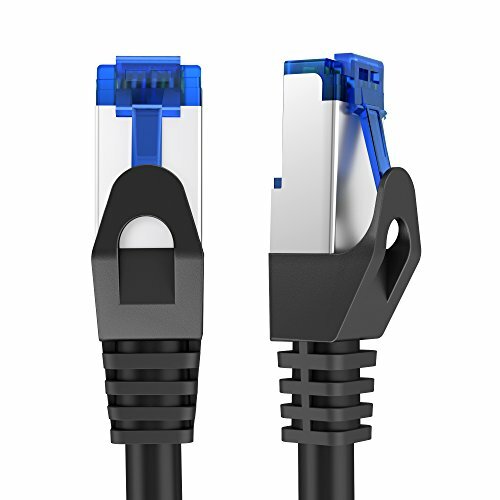 Sourcing the best possible materials, our high-tech manufacturing techniques and meticulous quality control mean you receive an ethernet cable with unmatched quality and reliability. We’re so confident you’ll love the results, we’ll give you an 18-month money-back guarantee. If you have any issue with your purchase, please, feel free to contact us at any time.